PortfolioBox is a unique type of creative web app that lets just about anyone develop creative, bespoke web site solutions for their personal or business needs. The online tool (available in free and pro versions) can be used by architects, models, designers, photographers and other design-oriented people. It is also extremely handy for business people who would like a more hands-on approach for the look of their web site without needing to get their hands dirty with computer code. You start off with page templates which can then be altered, parts moved around and sections slotted in where needed. The improved text editor is extremely easy to use making it a cinch to paste in site content, slot in maps, embed YouTube videos or add a form for collecting visitor information. Their HTML5 fluid design environment makes it easy to design by trial and error, keeping what works and throwing out what doesn’t. An online portfolio has been created to showcase what is possible with the PortfolioBox system which really highlights the variety of design possibilities using their tool. The Pro-level page templates, which are mobile-ready, are made available for 30 days to give free account users a taste of what is possible with the paid account. 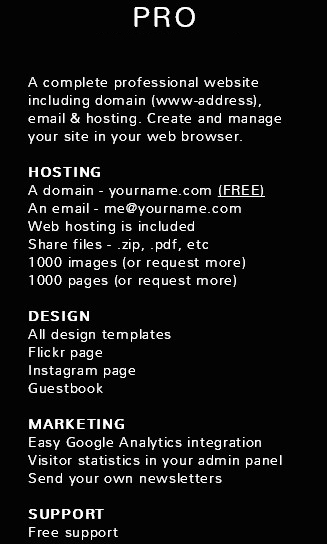 Forty images can also be hosted within the site too. Image galleries can be password protected to restrict access just to clients or a whole web site can require a log-in to view it. The Pro account is very affordable at just $6.9 per month. This account provides full access to the suite of features and development tools at PortfolioBox. All designed page templates can be used as a starting point with simple customizations possible from there. A guestbook, Flickr page and Instagram page are also available. Up to 1,000 pages can be created, with 1,000 images (more can be requested). Web hosting is provided with a new dot com (.com) registration and functioning email accounts to help keep in touch with customers. Email newsletters can also be sent out to customers using the marketing area. To help with tracking site activity, Google Analytics can be incorporated into the site to monitored visitor statistics. Visitor information may also be viewed directly from the admin panel too. There is also free support available which includes an extensive knowledge base to answer the most common queries and provide tutorials where needed. With many web site online apps, you must choose a theme that has already been created for you. This can be very restrictive. Often we may like the general look of the home page on one theme, but we would like to have the same type of page from one of the other themes available; and this is impossible! With PortfolioBox, the page templates can be placed on a site however they are needed. The home page from one template can be used for the homepage on a site, but an inner portfolio page with a horizontal image gallery from a different template can be inserted into the site too. Additionally, changes can be made to any page, move elements around or just to make minor tweaks until the page provides exactly the right functionality. This kind of customization on the fly and true flexibility is unheard of. E-commerce features are provided on all accounts, free and pro alike. 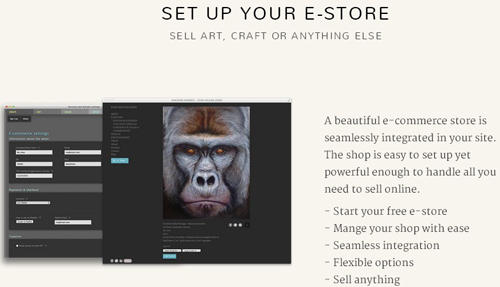 Create an e-store to offer products for sale. The e-store can be customized to change the appearance of the store to suit the product line. The shopping cart is fully integrated into the site. New items can be added quickly to the list of products already offered. Back-end payment processing can be performed using the PayPal integration for accepting credit cards, debit cards or PayPal payments. Shipping costs, regional taxes and order management is all included. This can all be setup and adjusted quickly from the Admin Panel. From the Admin Panel, it’s possible to add pages to the site really fast and to quickly see what the created site looks like. When read, just click the eye symbol in the top right corner of the screen to see the web site in progress. To add your start page (otherwise known as a home page), click under the Create section and then “Create a new page”. A list is shown where you select which type of page you wish to add, such as a gallery page, simple page, contact page, video page, and more. This will then slide open a section displaying all the different types of pages to choose from within this type, choose a page template and then click “Select”. A pop-up will appear showing the page template in greater detail before finally choosing to add it to the site. Once a page is added, it will be shown on the screen. Clicking the + symbol in the bottom right corner of the screen will jump to the editing section to fill out the page information. For a gallery, this information would include giving the new gallery page a name, adding images for the gallery, a caption for each image, etc. The features described in this article such as adding an email newsletter, editing a page or including social media links, can all be accessed through the convenient Admin Panel. 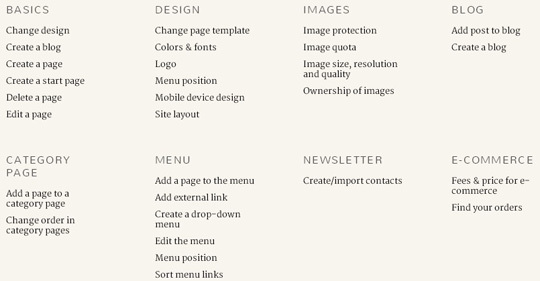 A row of menu options reside at the top of the web app, with separate menu options running down from the top. The sections are: Create, Edit, Design, Market, Settings and Communication. The Create, Edit and Design sections refer to adding pages, editing existing pages and customizing colors, fonts and other design elements. The Market area accesses options for social media and email marketing. The main Settings area includes options for adjusting mobile display, adding PayPal payment account information, including the domain name for your hosting, etc. PortfolioBox is an extremely flexible development environment that suits people of all levels of experience who wish to give it a try. Setting up new sites is fast, with an enormous number of design choices available to create exactly the site desired without expensive designers needed.